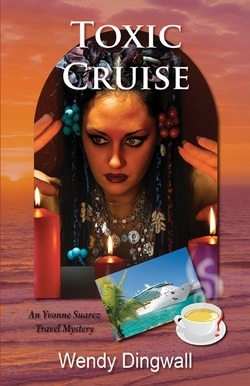 A shocking murder mystery set aboard a cruise ship and across exotic Caribbean ports. Jamaican Psychic, Mumma Katrina, scheduled to tell fortunes for fun as part of the Halloween festivities, can’t help but be drawn to Yvonne. She warns Yvonne that she is meant to stop an evil darkness. Yvonne tries to deny the bad feelings appearing on her own radar but then the buxom girlfriend of the has-been actor, seated at the Captain’s table, is poisoned. As David expects, Yvonne’s natural curiosity draws them to investigate the cause, and they soon discover an evil obsession that leads to murder, putting Yvonne and her loved ones in jeopardy.